For over two decades economic activity in Cuba has been formally bifurcated by restricting the access to and uses of two currencies – the Cuban Peso and the Cuban Convertible Peso (formerly also the US Dollar). These dual currency separations were instituted to protect state socialism from the politico-economic “shocks” of foreign direct investment during the Special Period as well as to safeguard the Cuban population from the adverse cultural and moral ramifications of market-oriented tourism initiatives. Since last year however, a process to eliminate the dual currency system has been put into motion, leading to the eventual death of the (in)famous Cuban Convertible Peso (CUC). Here, I take a look at currency iconography and its significance in understanding the political and symbolic sensibilities of the dual economy, as well as its long awaited demise. In an insightful essay, economic anthropologist Keith Hart argues that every coin is a metaphor for the two mutually constituted sides of money – the head, signifying the state, and the tail, symbolizing the market. The head and tail therefore represent the double-edged quality of money as both a token issued and authorized by the state as well as a commodity produced through relations of the market. In Cuba, these two sides of money have been disconnected and transposed onto two distinct currencies. The iconography found on the currencies displays some of these motivations. 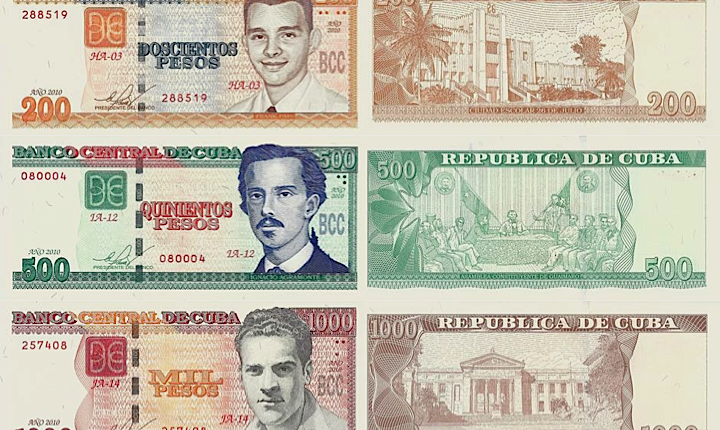 As seen in Figure 1, the Cuban Peso has images of leaders that fought in the revolution and Cuba’s independence movement, and the CUC has corresponding images of the monuments commemorating these leaders that are also important tourist attractions. The Cuban Peso is la cara (the head), stamped with the faces of Jose Martí and Ernesto Guevara, the founding fathers of the Cuban nation state and state socialism. The CUC is la cruz (literally ‘cross’ but used to mean tails), marked by Guevara’s mausoleum in Santa Clara and Martí’s memorial in Havana’s Plaza de la Revolución, representing the “cross” or sacrifices borne because of foreign tourism, which Fidel Castro once famously declared “a necessary evil.” These monetary dualities were strictly enforced in practice, so much so that tourists traveling to Cuba often did not even know that the Cuban Peso or the moneda nacional circulated in the economy. 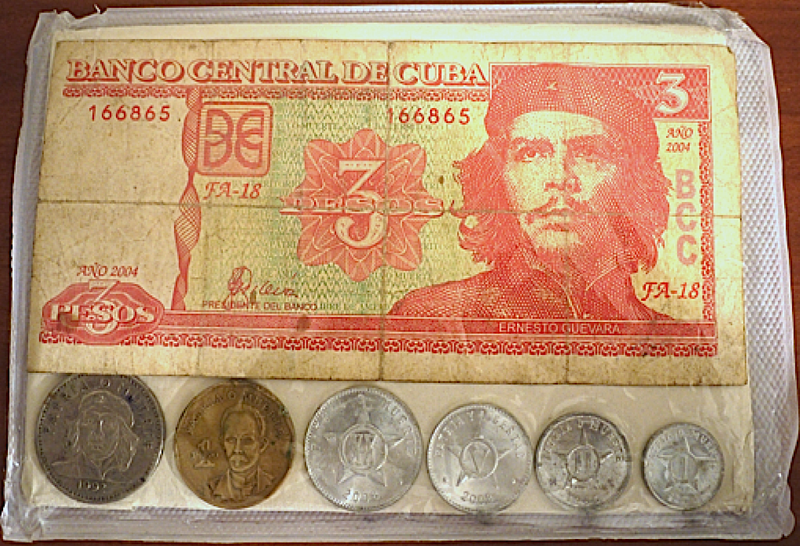 Tourists would be duped into paying hefty prices for clumsily packaged Cuban Peso bills and coins that they assumed were numismatic relics of revolutionary Cuba to be carried home as souvenirs (Fig. 2). This was largely due to the enclave package tourism promoted by the Cuban government confining foreigners to specific sites and neighborhoods as well as restricting Cubans from entering tourist hotels, resorts and restaurants, a ban that was lifted only in 2007. In the same vein, the purpose of the dual economy was precisely not to leave Cuba’s future up to the “fate” of suicide at the hands of imperialism that could seep in through an influx of foreign money, products, bodies and ideas. The buffer put in place by the dual currency system was meant to cheat chance and rig the toss between what were, at the time, deemed to be two contradictory economic and ideological outcomes – cara O cruz, state or market – in favor of preserving the legitimacy and power of the socialist state. Since the announcement of the Lineamientos in 2010, there have been several shifts in the economic landscape in Cuba geared toward a system, many term “market socialism.” This has included among other things legalizing the purchase and sale of property, expanding the self-employment sector, creating favorable terms for foreign direct investment as well as restoring diplomatic ties with the United States. Currency unification is one of the biggest challenges in this process due to distorted exchange rates and price and wage structures as well as disparate accounting practices, to name a few. But the end of the dual currency system and implementation of the Lineamientos more generally, mark a more open embrace, or perhaps resignation, to the interaction and mutual constitution of the state and market – cara Y cruz. There hasn’t been any firm announcement of how the dual exchange rates, of state enterprises operating at 1CUC=1CUP and individual and households paying 1CUC=24CUP for retail purchases, will be merged. However, some steps toward unification are gaining momentum, in particular to create trust in the Cuban Peso that Cubans think of as small change. 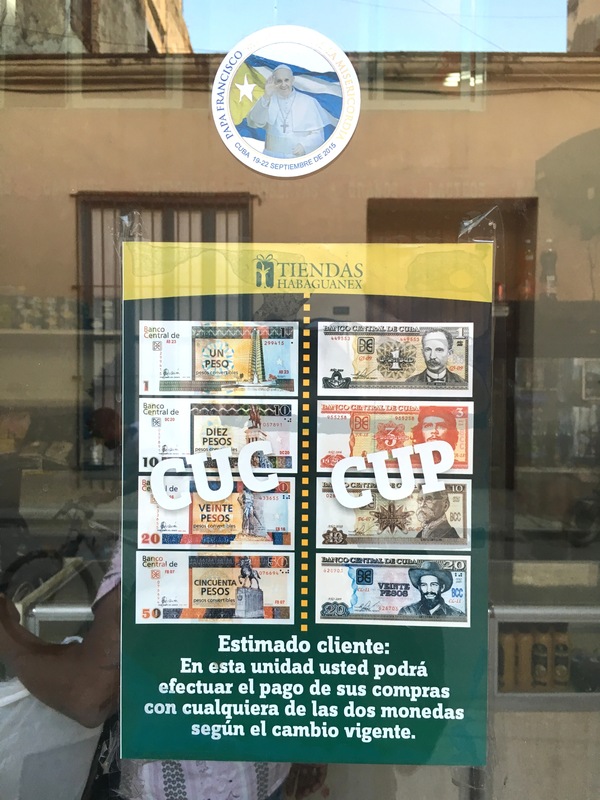 Now prices are being listed in both currencies and there are omnipresent signs in divisa stores declaring that they accept payments in the CUC and Cuban Peso (Fig. 3). For the first time in over two decades Cubans are actually holding on to their moneda nacional as the currency of savings and value storage, for fear of the CUC being suddenly devalued or taken out of circulation, like the US Dollar in 2004. The Banco Central has also printed higher denomination Cuban Peso bills (200, 500, 1000) to accommodate high-price purchases. 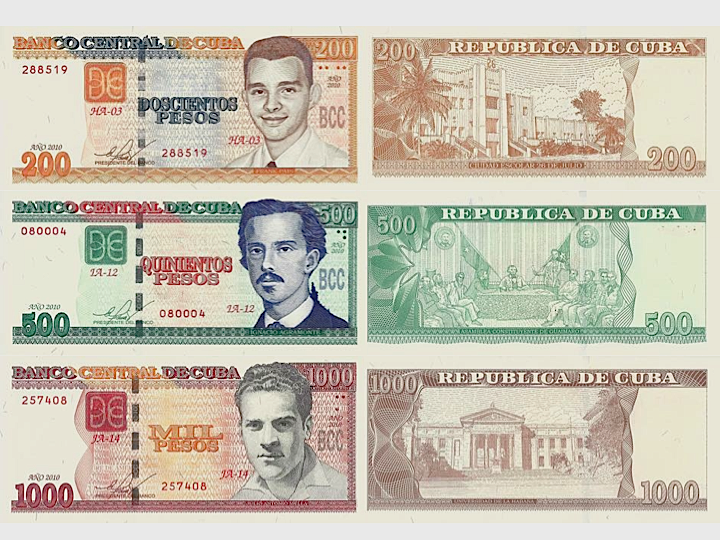 The aesthetics of these new bills are in many ways in keeping with past notes because they continue to depict lighter skinned Cuban heroes that are all men. 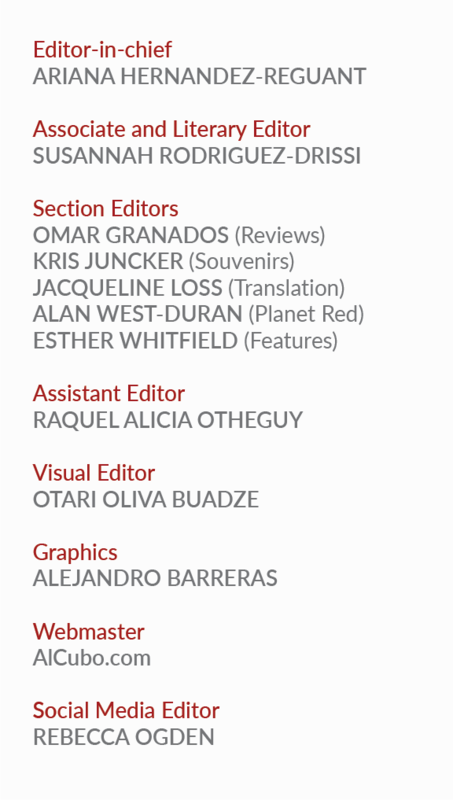 Celia Sánchez does appear on the bills, only in the background as a watermark, but she does ensure national security by protecting against counterfeit! What is striking about these freshly minted banknotes is that they all bear the faces of extremely young pioneers, martyred, much before their time, fighting for the nation – young heads, if you will. Frank País on the 200-note, a revolutionary leader and organizer of students and youth after the 26th July Moncada Barracks attack in Oriente, was killed by Santiago police in 1957 at the age of twenty-two. The tail side features Ciudad Escolar 26 de Julio, buildings of the Moncada Barracks that were turned into a school. Ignacio Agramonte on the 500-note, a young general in the war of independence against Spain, died in battle at the age of thirty-two. The tail side portrays the Constituent Assembly in Guáimaro in 1869 where Carlos Manuel de Céspedes, Ignacio Agramonte and others approved the Constitution in effect during the Ten Year War. Julio Antonio Mella on the 1000-note, founder of the “internationalized” Cuban Communist Party was assassinated in 1929 at the age of twenty-five. Mella is also featured on the logo for the Union of Communist Youth (UJC). The tail side shows the University of Havana. Currency iconography has long been associated with assertions of collective identity and national belonging. With increased youth emigration and the demographic crisis of a graying workforce in Cuba, these images of young fearless champions as well as educational institutions seem like an appeal to a new generation to feel included in the nation and for them to have a stake in Cuba’s future development. It is also a way of restoring trust in the issuing entity of the Cuban Peso by symbolically associating it with a set of early yet intrepid “heads.” This is fitting because, it is, after all, the next cohort of younger post-Castro leadership that is tasked with taking forward the instituted process of reconciling the role of the state and the market i.e. cara Y cruz of the Cuban Peso itself. Mrinalini Tankha is a Postdoctoral Scholar at the Institute for Money Technology and Financial Inclusion at the University of California Irvine. Based on ethnographic fieldwork conducted in Havana since 2007, she is currently working on a book manuscript titled The New Cuban Counterpoint: Money and Dual Currency Exchange in Post-Soviet Cuba.